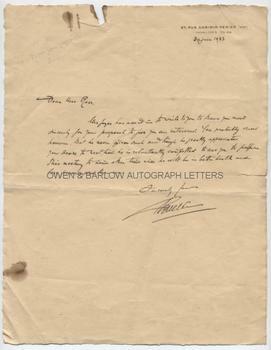 JAMES JOYCE Letter written on his behalf and signed by his secretary and amanuensis, Paul Leon. Irish novelist. Author of 'Ulysses' and Paul Leon, the writers secretary, amanuensis, close friend and confidant. 1p. 27 rue Casmir-Perier [Paris]. 30th June 1932. To "Dear Mr Ross". 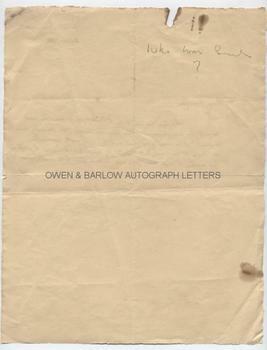 Mr Joyce has asked me to write to you to thank you most sincerely for your proposal to give you an interview. You probably know, however, that he never gives such and though he greatly appreciates your desire to meet him he is reluctantly compelled to ask you to postpone this meeting to some other time when he will be in better health and less preoccupied than now. Sincerely yours, Paul Leon." 4to. 27 x 20.5 cms (10.5 x 8.25 inches). Slight paper clip damage and old rust mark to top and left edges. All else very good. At the date of this letter James Joyce was working on 'Finnegans Wake'. He was, however, beset with increasing health problems, failing eyesight and anxiety over the mental state of his daughter, Lucia, and the writing was painfully slow. During his time in Paris, Joyce relied more and more on his close friend and confidant, Paul Leon, who dealt with almost all Joyce's correspondence during this period, often writing to Joyce's dictation. Their association ended when Germany invaded Paris. Joyce fled to Zurich in 1940, where he died shortly afterwards of a perforated ulcer. Paul Leon, who was Jewish, was murdered by the Nazis in 1942. He had, however, saved most of Joyce's papers and correspondence which remained in his family for many years before being sold to institutions.